This afternoon at Georgetown University, President Obama is announcing a comprehensive initiative to cut carbon pollution in America, while also working with other countries to reduce the global risk of climate change. The president’s plan, released this morning, highlights ongoing efforts to reduce greenhouse gas emissions by increasing fuel efficiency and reducing vehicle emissions. Specifically, the Obama Administration now plans new federal standards for heavy duty vehicles, covering trucks, vans and other large vehicles produced beyond 2018. The Obama administration has already issued two sets of standards boosting fuel economy and reducing emissions for passenger cars and light duty vehicles, one covering the 2012 through 2016 model years, and the second covering vehicles produced from 2017 through 2025. The most recent standards require an industry-wide average of 54.5 mpg for light-duty vehicles by 2025. In August of 2011, the Administration also implemented the first-ever fuel and emissions standards for heavy duty vehicles, the second-largest source of greenhouse gas emissions in the transportation sector. The national Heavy Duty (HD) program, covering everything from delivery vans to garbage trucks to 18-wheel heavy rigs, now runs through 2018. During the President’s second term, the Administration will once again partner with industry leaders and other key stakeholders to develop post-2018 fuel economy standards for heavy-duty vehicles to further reduce fuel consumption through the application of advanced cost-effective technologies and continue efforts to improve the efficiency of moving goods across the United States. Current heavy truck rules require varying levels of improvement for different vehicles. Garbage trucks, for example, must improve fuel economy by 10 percent by 2018; delivery vans by 15 percent, and large tractor-trailers by 20 percent. A typical big rig, which can weigh more than 20 tons when fully loaded, might currently achieve an average of six miles per gallon of diesel fuel. Even a 20 percent improvement won’t yield anything near current or projected fuel economy for light duty vehicles. But tractor-trailers often travel over 150,000 miles in a year, with a fuel bill of $100,000 or more. 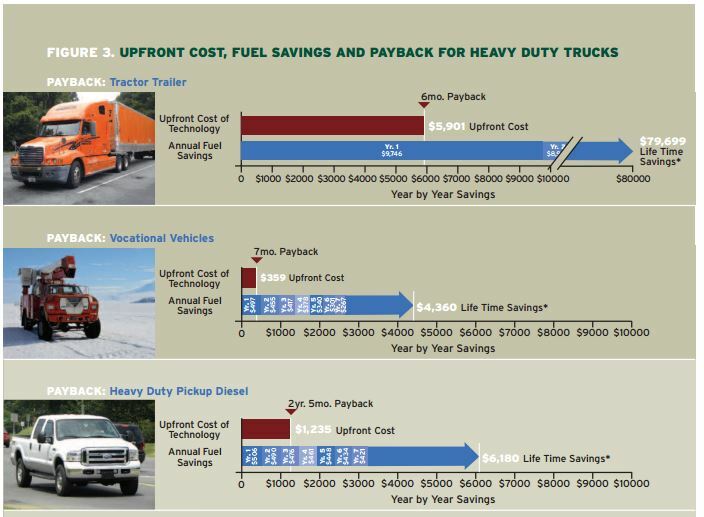 So even modest improvements can mean significant savings for truck operators. The Obama Administration projects the current HD program will reduce greenhouse gas emissions by 270 million metric tons, save 530 million barrels of oil, and save $49 billion in lower fuel costs, reduced emissions, and other savings over the lives of model year 2014-2018 vehicles. Stay tuned for savings to be achieved with new post-2018 rules for heavy duty vehicles.